You can now automatically register someone for a EverWebinar powered webinar upon purchase. Follow the instructions below to integrate your EverWebinar account with PayKickstart. Step 1: Login to your EverWebinar account and grab the API key. Here are instructions on how to find your API key. Step 2: Click on the top right navigation in PayKickstart, then click on Integrations. Go to the Webinar tab and click “Add Integration”. Choose EverWebinar as the service and enter an account name (for display purchases) and the API key provided by EverWebinar. 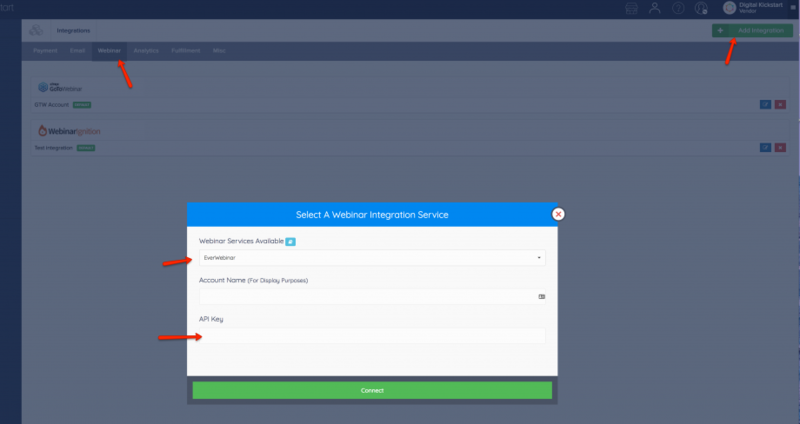 Step 3: To automatically register a new customer to a webinar, you need to go to the Edit Product screen and on the 3rd step under Webinar Integration, you will select EverWebinar as the webinar service and then select the specific webinar they should be added to.